As many traditional Irish blessings and toasts would suggest, The Irish truly have an optimistic outlook on life. And there’s no better time to celebrate life’s positivity than St. Patrick’s Day. What started as a religious holiday in Ireland is now a widely-celebrated day of the Irish culture worldwide. America first started recognizing St Patrick’s Day in 1762, in the form of a parade in New York City. Today, we commemorate St. Patrick’s Day with festivals or a pub, with authentic Irish food, brews and music. If you find yourself in South Carolina on March 17, don your buckle hat and polish your shillelagh before you join the festivities in one of these 10 best places to celebrate St. Patrick’s Day. Enjoy views of the Atlantic Ocean as you chow down on shepherd's pie, corned beef and cabbage, or a variety of other classic pub grub. In true Irish fashion, you can expect Molly Darcy’s to keep the fun going with several days of festivities, including drink specials, live music and dancing, and more. Tucked in the heart of downtown Spartanburg, you can belly up to a bar loaded with 32 beers on tap and live music most nights. Just like the Irish, the folks at Delaney’s know how to have fun, especially when it comes to planning a menu. Their featured lineup includes dishes like Hangover Pie, Guinness Brats, and Irish omelets. You can join them for their annual St. Patrick’s Day Bash, with plenty of food and drinks specials and live music from local legends. Many folks come for the global beer selection or award-winning wine list, but the real winner here is their unique blend of Irish, Scottish and American cuisine. This pub combines delicious recipes with a farm-to-table experience from the owners’ personal farm for many of their dishes. For St. Patrick’s Day, they typically feature a Green Beer Lunch, Irish folk music, food and drink special, party favors, and plenty of friendly festivities. On March 17, dress in your favorite green hues and park yourself on the side of King Street to watch an onslaught of floats, vehicles, musicians, and performers march their way through town. St. Patrick’s Day parades have been a tradition for centuries, but the first one in Charleston is thought to have happened in the mid-18th century. Charleston is steeped in rich Irish history, and it’s only fitting that one of the greatest St. Patrick’s Day parades happens here every year. Touting itself as Charleston’s original Irish pub, you can expect plenty of fun, food, and flair. Here, St. Patrick’s Day is more like St. Patrick’s Week, where you can find great live music, drink specials, and other festive fun for days. As Folly Beach’s only Irish pub, you can expect the place to be brimming with the luck-o-the-Irish. Named after Dublin, Ireland’s Guinness Brewery, you can enjoy over 20 draught beers, traditional Irish dishes, and their special frozen Irish coffee. Upstairs you can usually find live music any time of year, including during their St. Patrick’s Day festivities. Typically held the week before St. Patrick’s Day, party-goers can fill their bellies with choices from several food vendors while they fill their ears with live music. They even have a little something for the kiddos, in the form of bounce houses, balloons, and face painting. Don’t let the palm trees fool you—beach goers appreciate those orange beards and pots o’ gold as much as any of the Irish folk. 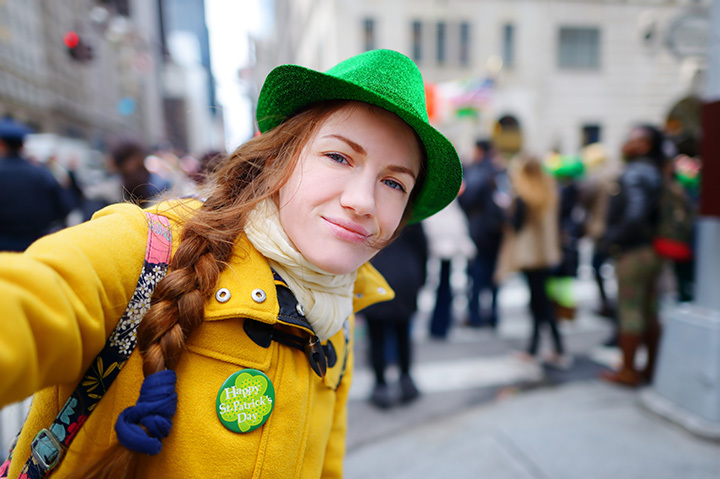 Nearly 30,000 people crowds the streets and sidewalks each year to celebrate all things Irish. The Main Street parade kicks off the day’s festivities, followed by live music on multiple stages, kiddie rides, games, food, drinks, and other vendors. The folks at O’Keefe’s Irish Pub know how to celebrate their heritage—so much so that they always have a countdown to the next St. Patrick’s Day! It might be an unassuming place from the outside, but inside is where it counts. You can treat yourself to 100 percent authentic Irish food, and revel in the company of live Irish musicians and well-decorated party goers. The owner’s grandparents hail straight from Ireland itself, having owned one of the most popular pubs in the country. These guys are doing it right! If you’re a music lover looking for a pot of gold, you’ll find it in Five Points on March 17, with over 15 performing bands spanning four stages. Bring the family for fun crafts or the parade, or bring your friends for some cocktails and good times. This is by far the biggest street party in the Midlands, and one of the biggest St. Patrick’s Day festivals in the entire Southeast.